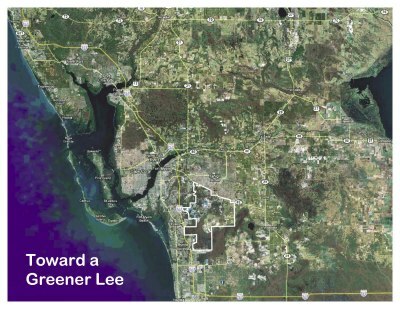 This page provides information and links to "Toward a Greener Lee: Effective Planning Alternatives for Rural Lee County" - a preliminary planning study about southeast Lee County. Download the complete report by clicking here. As the frontier of new growth moves deeper into rural and environmentally sensitive lands, increasing attention must be paid to the effects of that growth. Florida's current water shortages and continuing destruction of natural resources indicate that much remains to be done, especially in southeast Lee County. Most land there was designated as a "Density Reduction / Groundwater Resource" (DR/GR) area in 1990. The background and aftermath of the DR/GR designation is detailed in Section 2 of this report. Since 1990, 35–40% of DR/GR land has lost this protection without any comprehensive review of the cumulative effect of those losses. Several shortcomings of the DR/GR designation result from the area's sheer geographic size and amazingly diverse character. For instance, a single set of regulations now applies to the entire area. Lee County is now facing an influx of applications for major new mines in areas previously used only for farming, nature preserves, and rural residences. If many of the applications are approved as proposed, DR/GR lands would be irrevocably changed. Instead of an area whose natural resources and opportunities for rural living were being protected from suburban sprawl, this area would become an industrial zone. 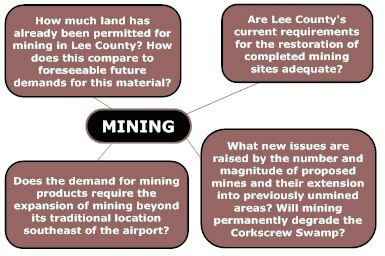 Mining would take place perilously close to the Corkscrew Swamp Sanctuary and other nature preserves, all to supply limerock well beyond the current local markets for Lee County's mines. Historically, planning for rural areas has taken a backseat to urban planning. Rural planning often starts and ends with requiring large lot sizes and putting off all further consideration until growth pressures become overwhelming. That approach is no longer acceptable in Lee County. Every planning effort should start by asking the right questions. 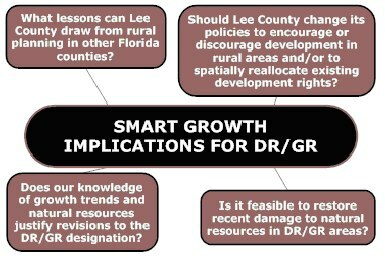 Some of the important questions for planning in Lee County's rural areas are highlighted here. Once the most important questions are formulated, a successful planning process applies resources to find accurate answers and to develop policy suggestions based on those answers. In the past eight years, major rural planning efforts have been undertaken by coastal counties in south Florida: Sarasota, St. Lucie, Martin, and Collier Counties. Each plan attempted to concentrate development rights instead of requiring oversize lots in order to preserve agricultural uses and protect natural resources. These plans used widely varying techniques to achieve that goal. 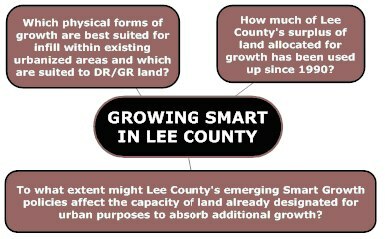 Each plan is summarized in Section 3 of this report, and lessons for Lee County are drawn in Section 4. 1. Understand the unique ecological character of the land. McLane Environmental has just completed a review of technical studies of the DR/GR area. Some data gaps remain, but the evidence is overwhelming that in addition to irreplaceable groundwater resources, equally valuable resources are above ground. The data gaps should be filled and DR/GR policy revisions made to ensure these resources aren't obliterated or lost piecemeal in coming years. 2. Consider the land's potential for restoration and acquisition. Farming practices have eliminated some native habitats and lowered groundwater levels. However, this damage can be restored to re-create natural flow-ways and repair drainage features that have lowered historic water levels. Farmland should not be viewed as ruined land that is now suitable only for development or mining. Preservation and restoration of natural habitat should have the highest priorities. 4. QUESTION: How can mining best be integrated? Lee County responds to each proposed mine through the rezoning process. Rezonings are approved only for proposals that meet all Lee County requirements; there is no guarantee of mining or other land uses that are not permitted by current zoning. The rezoning process seemed adequate when mining served only local markets. Lee County is now entering a new era where national and international mining companies are trying to reserve future rights for mining on a scale never before seen in Lee County. The decisions made in the next two years will determine the future of DR/GR lands, not just for the next generation or two when mining is taking place, but far into the future. Completed mining pits will continue to influence groundwater flows to and from public well fields, nearby wetlands, and regional natural systems such as the Flint Pen Strand and Corkscrew Swamp. Fortunately, Lee County need not (and cannot) approve any mine applications that do not fully conform to county regulations. Lee County should assume in advance that the outcome of this effort will be a healthy mix of planning techniques including new regulations, incentives, and acquisition and restoration of land. This report concludes with specific suggestions for managing the DR/GR planning process and for interim changes to the Land Development Code. Bound copies of the complete report are now available for $25 from the Estero Community Improvement Foundation. A copy is also available on the reference shelf at these public libraries: Bonita Springs, Fort Myers, East County Regional, and South County Regional, call number REF 307.12 TOWARD. Or download the complete report by clicking here. Lee Commission: Keep DR/GR study limits focused (December 14, 2007).